Stop snoring tonight and have sweet dreams again with your spouse. It's not complicated! Fit in 5 minutes and enjoy a peaceful night's sleep. The QuietNite Z (QNZ) works by keeping your airway open while sleeping which stops the snoring noise. Wake up refreshed with more energy. •	The QNZ mouthpiece concept has been validated with numerous medical and scientific studies. •	Although it has been scientifically proven to help treat snoring and sleep apnea, it may not work for 100% of the people. Our satisfaction rate with the product is better than 95%. •	The most common cause of snoring is air being passed through a partially constricted airway causing vibration of the palate during breathing. The QNZ mouthpiece works by moving the jaw forward, which opens up the airway and stretches the palate so it does not vibrate (or vibrates less). •	You can try this. Close your mouth with your teeth together. Then try to make a snoring sound. •	Then open your mouth a little and move your jaw forward a little at a time and try to make the snoring stop. You will see that the snoring stops or improves. This opening and jaw forward movement is how the mouthpiece stops your snoring. •	The mouthpiece holds the jaw in that location while you sleep. •	For most people you will know the first night, if your snoring stops. If it stops your snoring for even a short while, then you know that moving your jaw forward and holding it there will work for you. Purchasing the QNZ is an economical option to determine if a snoring mouthpiece can help stop your snoring. •	Following the good sleep hygiene tips http://mouthguardstore.com/articles/how-to-stop-snoring-remedies found in the article section at the mouthguardstore.com website will assure you the best chance to stop snoring. •	If you do not see improvement right away, try tweaking the QNZ with the steps described below. •	There are many factors that can affect the life expectancy of your QNZ. Grinding your teeth while you sleep, how clean you keep it and how you store it will all play a part. •	It is important to confirm that a snoring mouthpiece can help treat your snoring. The QNZ is a very good first treatment option due to its modest cost and easy fitting process. •	While many clients replace their QNZ with another one as they periodically wear, others upgrade to a thinner, better fitting and more durable laboratory custom fit appliance called the QuietNite Z Elite. 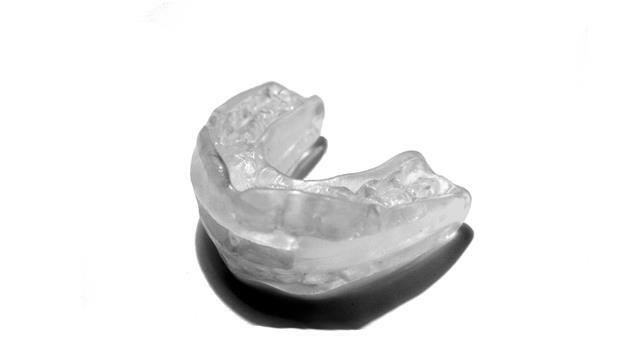 These are available at the mouthguardstore.com website. •	The QNZ has been engineered with large breathing holes to allow you to breathe easily. •	It is normal for one side of the nose to be temporarily blocked when you first lie down so the breathing holes are helpful. Most people you will revert to nasal breathing within 15 minutes. •	Most people can see an improvement in their snoring by tweaking the QNZ mouthpiece. Try these steps first to get improvement before returning the mouthpiece. •	Refit the mouthpiece according to the initial instructions and move the jaw farther toward the front. You only want to do this as far as necessary to prevent jaw soreness. •	Some users have reported that application of denture adhesive keeps the mouthpiece in place enough to stop the snoring. •	If the snoring does stop but does not stay in long enough, then investing in a custom mouthpiece such as the QuietNite Z Elite or a custom device from dentist may be a better solution. •	First try to remold the mouthpiece or buy another QNZ if this fails or upgrade to a custom QNZ Elite. •	If the problem persists, your jaw may be pushed too far forward. Then you can remold the mouthpiece with your jaw not so far forward. •	The custom QNZ Elite distributes the force more evenly and can be a better option if your see stop snoring success with the regular QNZ. •	All QNZ products are cleaned in a similar fashion. First use a soft toothbrush with liquid soap to remove any debris. Tooth pastes often contain abrasives which can damage the QNZ surface over time causing it to be more susceptible to staining. •	Soaking the appliance in a denture cleaner such as the Oxygone cleaner available from the MGS will gently clean the mouthpiece and give it a fresh minty taste. •	Almost everyone with Obstructive Sleep Apnea snores. A mouthpiece which helps stop snoring will also likely improve OSA. •	However, since this is a dangerous medical condition associated with heart disease and other problems, you should be monitored by a sleep physician if you have sleep apnea. •	The QNZ and other mouthpieces can be prescribed by a physician or dentist trained in sleep breathing disorders. •	If you have partial dentures and some front teeth in both upper and lower jaws, the QNZ may work. •	If you wear full dentures the QNZ will not work. You should consider the AveoTSD. Contact our technical department EM: info@mouthguardstore.com for more advice. •	The QNZ is considerably cheaper than the custom QNZ Elite. •	The QNZ is a “boil-and-bite” mouthpiece, which means you put a thermo-plastic mold in hot water and then bite into it so that it takes the shape of your teeth; this is not customized specifically to your teeth. •	The custom QNZ Elite is hand-made in a laboratory using a dental impression kit. The device is made using a near perfect impression of your teeth so fits more snugly. •	The custom QNZ Elite has thinner walls and is less bulky so you aren’t as aware of it when you wear it. •	The QNZ grips mainly the front teeth, whereas a custom QNZ Elite grips all the teeth. This helps it to sit more securely and comfortably on your teeth while you are asleep. The QNZ has been shown to stop or improve snoring for most people. If you are not satisfied with the results please contact us for help. If we cannot resolve your issue, you can return the mouthpiece for a full refund of the product purchase price within 30 days of purchase. Contact info@mouthguardstore.com for return instructions. Note: customer is responsible for return shipping. The refund will be made for the full purchase amount and can be expected within 7 business days of returned product receipt and inspection. Initial shipping or “Trial” costs are not refundable. To optimize success of the QNZ you should read and follow all directions and safety instructions carefully before using the boil and bite fitting process. Check to make sure it is not too hot before placing in your mouth. The manufacturer cannot directly oversee the fitting process and as such the user assumes all the risks and liabilities. Do not store it near any heated surface, chew on the mouthpiece and keep away from pets. The QNZ mouthpieces are fabricated from FDA approved surgical materials, ethylene vinyl acetate. The line of QuietNite Z products are intended to treat simple snoring and may be used for treating Obstructive Sleep Apnea snoring symptoms with a doctor’s prescription. Other conditions which may be helped are tempromandibular joint disorders (TMJ) and night time clenching. Medical or dental supervision may be necessary for these conditions. As the end user it is your responsibility to read and follow all directions and safety instructions carefully before boil and bite self- fitting or user- fit impressions. The user of the self-fitting mouthpiece assumes all the risks and liabilities and there is no implied guarantee of safety or enhanced performance as other variables exist beyond control of the manufacturer or retailer. I am ordering my second Quiet Night Z mouthguard. I have used the first one for over a year. PROS: My husband has gotten much better sleep because I'm not sawing logs all night. My snoring is mostly eliminated and I feel more rested with no more raw throat in the morning. The guard is not hard to fit when you follow instructions carefully; it does take a few minutes, though. You can redo it if it doesn't feel quite right at first. CONS: (AND I THINK THIS IS MY OWN FAULT...) I should have ordered a new QNZ months ago. After extended use it kind of loses it shape and even after reheating and refitting doesn't fit nearly as well as in the beginning. Sometimes there's a little drooling out the corner of my mouth. Often there's too much suction and the insides of my upper and lower lips get sucked into the breathing holes, making little areas that protrude for a while in the morning and are easily bitten when eating breakfast! OUCH! My dentist is concerned because the alignment of my bottom front teeth has actually changed, and not for the better, because of how the QNZ pulls the bottom jaw forward to enlarge the breathing passage. All in all, the QNZ has helped my snoring enormously. I plan to buy a new one more often so as to not have the problems I have created myself! A properly shaped, sturdy item is very important in gaining maximum function and comfort. ***NO, I did NOT get this item for FREE in return for free product and a good review. I paid full price. I am very happy with this product it works as advertised. My wife is sleeping so much better now as she is a College student in nursing school and is under a lot of stress and in need of all the sleep she can get. Her first reply to me after the first night was it works keep wearing it please. Since I'm a woman who snores like a chain saw without a muffler, I can say without any exaggeration that this product works great! My family was horrified by the noise I could make while asleep. I think the dog was even sleep deprived. It takes a little getting used to but you may find that you actually sleep better with the QNZ. The fitting process is not complicated, but you do need to really try to bring your lower jaw forward and press firmly on the outside of your lips and cheeks while the appliance is pliable. Buying the 2-pack is great as you can keep one in your travel bag so you never are away at night without one. The Quiet Nite Z is very well made and easy to fit. But it is too small. Please make one that holds my mouth wider, about 5/8". The QNZ is more like 3/8" and doesn't do the trick. I don't mind fitting it myself. it was easy to do. I have a similar product I got from my dentist several years ago but it is no longer available and I have to have a backup. It is not just the snoring, it is the sleep apnea. This could be a lifesaver. Thank you for such a quick follow up on my order....I did receive the QuietNite Z mouthguard and it works fantastic.....What a find!!! !